Product #60786 | SKU 996552011 | 0.0 (no ratings yet) Thanks for your rating! 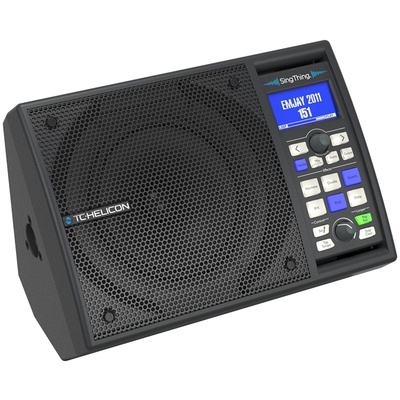 The TC-Helicon SingThing is an all-in-one vocal processor and personal PA designed to provide bountiful backing tracks, built-in effects, and easy looping for singers and songwriters in rehearsals, live shows, and club gigs. It features a 150W Class-D amplifier driving a 6.5” 2-way Tannoy speaker, plus an XLR output can be fed into a PA and a 3.5mm headphone jack enables personal monitoring. XLR, 3.5mm, and 1/4" inputs allow you to connect a variety of sources such as a microphone, keyboard or guitar, and smartphone. Over 200 presets in multiple genres offer fast tone configuration and built-in effects give you powerful tone enhancement at the push of a button. Record and layer riffs and vocal parts via the integrated looper, which features automatic tempo adjustment for the echo. When the looper is not in use, a dedicated Tap Tempo button makes it easy to set your delay time. The SingThing ships with an XLR cable, 3.5mm aux cable, USB cable, and an MP-75 microphone, which offers remote control of effects and looping.